Isn’t she spectacular? Nectaring furiously on Joe Pye weed flowers, she paid no attention to my close approach. A summer morning at Raccoon Creek State Park in western Pennsylvania. 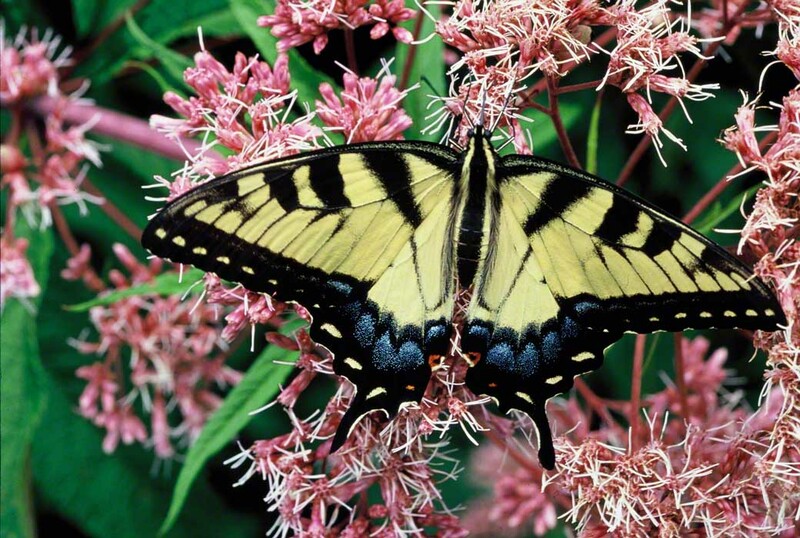 This native northeastern shrub is a magnet for swallowtails, skippers and many other butterflies. They bloom in sync with ironweed and thistle, so Papilio glaucus is well provided for. Those blue splashes on her wings just bedazzle me. No two individuals are alike, so I’m always on the prowl for a beauty like this one. Question. Why do you suppose it’s been named Tiger Swallowtail? Visit our other Tiger Swallowtail posts. Compare the wings of this female with the others. Amazing, isn’t it. Soon to be posted: a male Tiger. My guess is that “Tiger” comes from the black and yellow stripes (or black and gold if you’re a Pittsburgher). “Swallowtail” obviously refers to something unique about their tails, maybe the points. What I especially like about you photos is the information you write and your admiration for the butterflies. I learn from you so thank you. Thanks! I’m glad that you visited wingedbeauty.com. I’ll be continuing to add new posts over the coming days, weeks and months. When I lived in NYC I had the opportunity to visit the ‘diamond district’ and we used to go to pre-sale exhibitions at Sotheby’s and Chrisite’s (the major auction houses). I’ve seen the very finest of jewelry…when I began my macro- work with butterflies…I was stunned…the beauty of the butterflies easily exceeded the finest of jewelry! So, I go out there to find and admire..and now share. Thanks for your kind response. Please have a look at today’s Post of a Black Swallowtail. It’s just a sweet image.